Don and I part ways temporarily after Craters of the Moon. 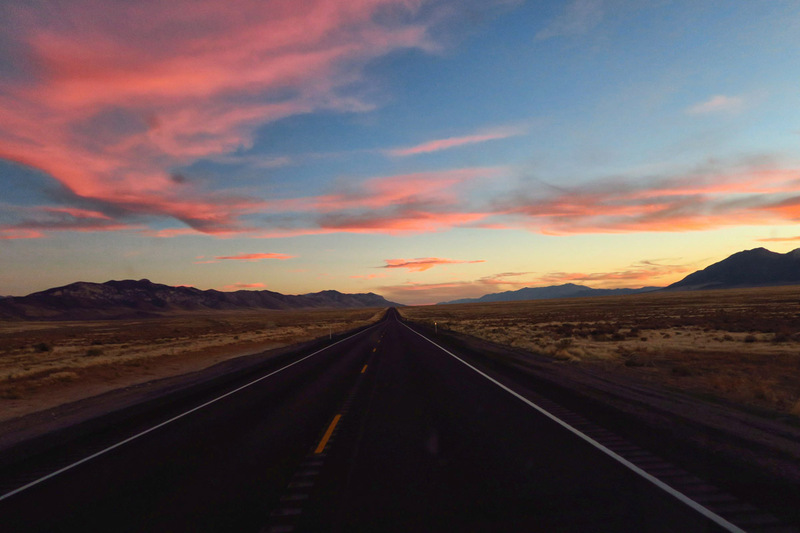 I am headed to Boise to see good friends known on this blog as “Tom the Awning Fixer” and his lovely bride Corinne, who graciously hosted me for a bit of Boise driveway surfing and a fabulous dinner. (No photos, as I all but changed the names to protect the innocent.) Don went on to wander in the forest, trying to prove J. R. R. Tolkien’s theory that “Not all who wander are lost.” Or are they? 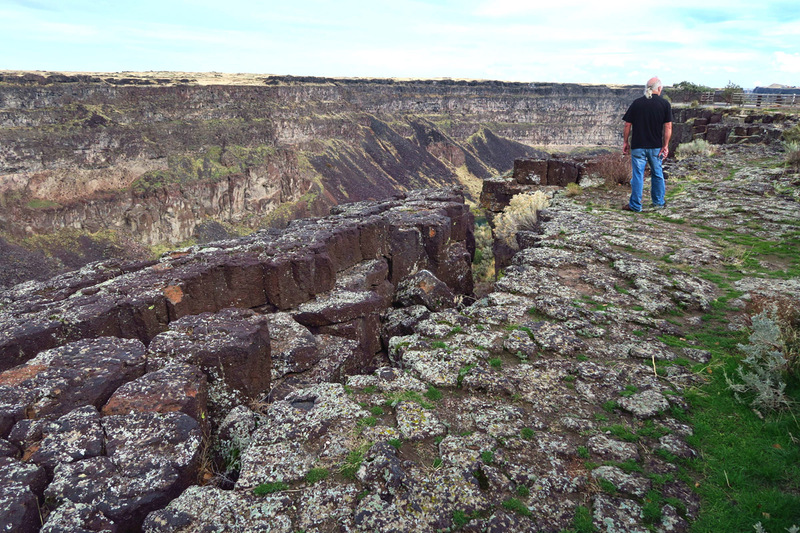 We meet back up in Twin Falls, a place for which I have done zero research. 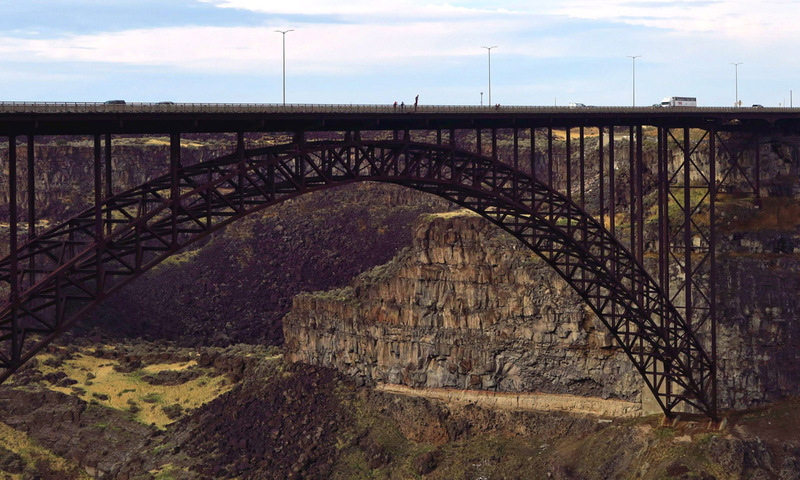 So imagine my shock to be driving along Hwy 93, when I unexpectedly cross the Perrine Bridge over the Snake River Canyon. Of course! How could I have forgotten Evel Kneivel’s unsuccessful attempt to jump the canyon in his steam-powered “Sky-cycle” during my college days? I also missed the fact that Evel Kneivel earned the Guinness Book of World Records distinction of having more broken bones in a lifetime than any other human. A Darwin study in the making if there ever was one. 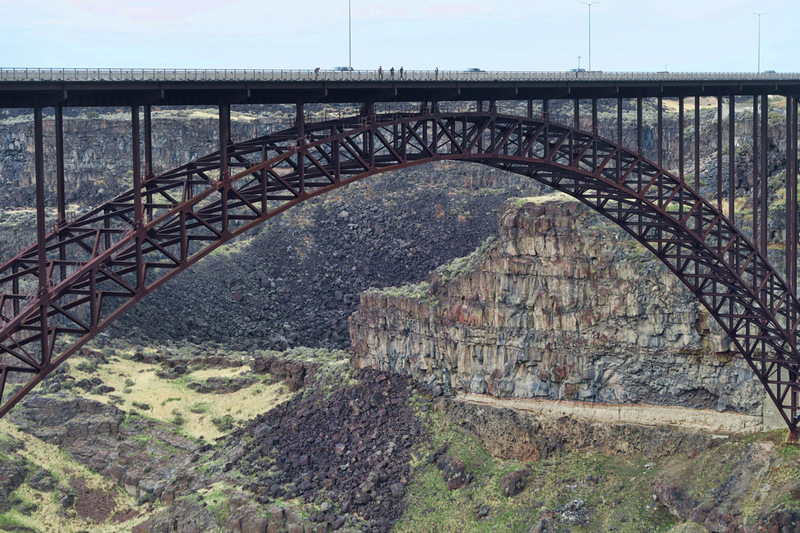 Perrine Bridge, original built in 1927 was the highest in the world. Replaced in 1976 with the current version. 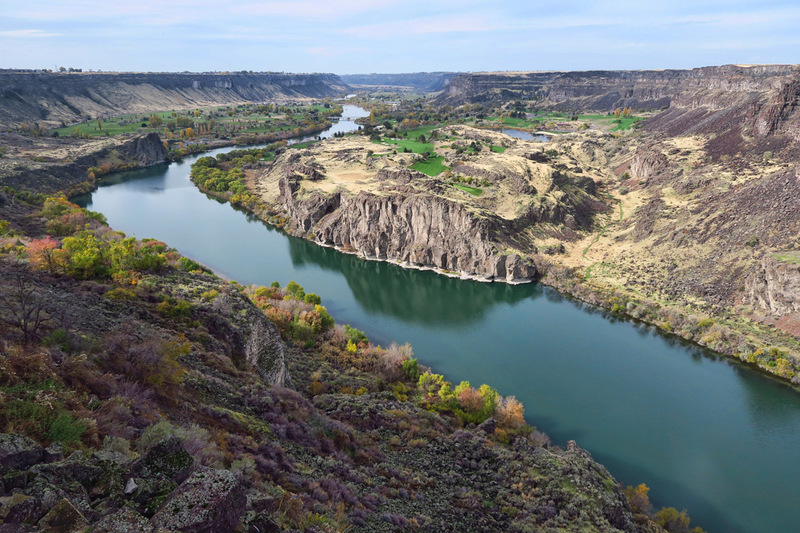 View of the Snake River Canyon from the Visitor Center overlook. There is a nice multi-use trail along the river. From the paved trail, you can walk out to the edge. Odd that many of the overlooks have no railing. 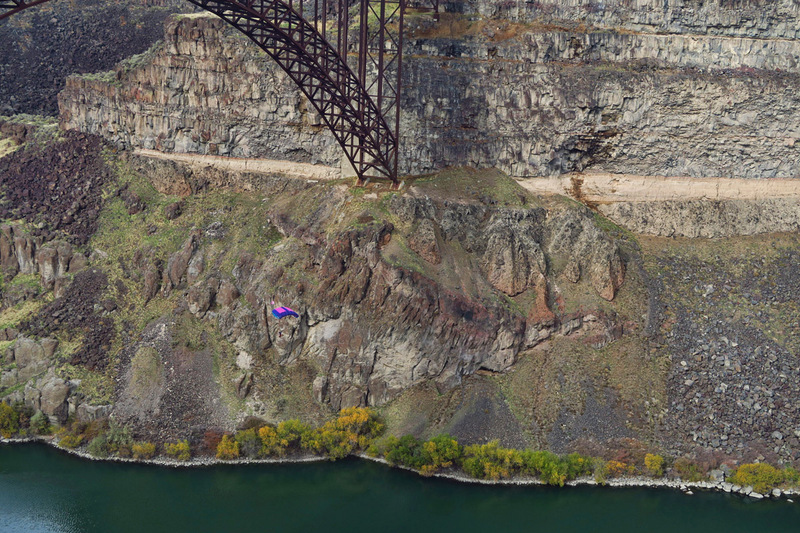 How could I have also missed that the fact that the Perrine bridge is the only structure in the country where BASE jumping is allowed without a permit? (BASE, an acronym for Building, Antenna, Span, and Earth, jumping with a parachute from a static structure.) Having tried sky diving, bungee jumping, hang gliding, parasailing, and glider planing, I drew the line at BASE jumping. Perhaps if I were a little younger, lest I end up like Evel. Packing their chutes for the jump. BASE jumpers walk out to center of the bridge. Note one stands on bridge railing for free-fall. It’s 486 ft down to the river. Don and I set out to do laundry, but I suggest first that we backtrack to the Snake River Visitor Center for some photos from the overlook. There, we meet a nice young man from South Africa, packing his parachute on the grounds of the Visitor Center. I had no idea BASE jumping was allowed, so we quiz him on where and how he plans to use this chute. 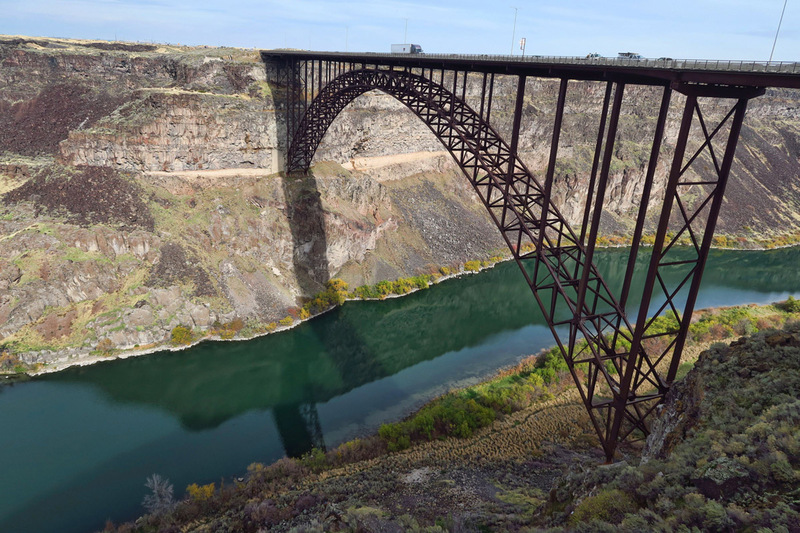 He tells us all about the jumps that are about to take place from the Perrine Bridge, and gives us suggestions for the best vantage point to view them. We watch five different jumpers leap from the railing of the bridge. 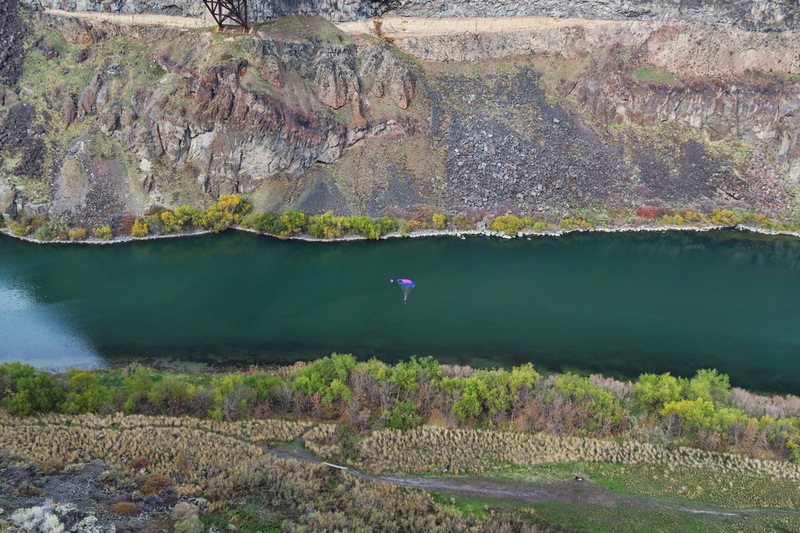 Only a 486 ft drop to the river, takes mere seconds to drift down to their landing zone. That’s a lot of effort for a five-second thrill, but fun to watch them float to their designated target, nonetheless. 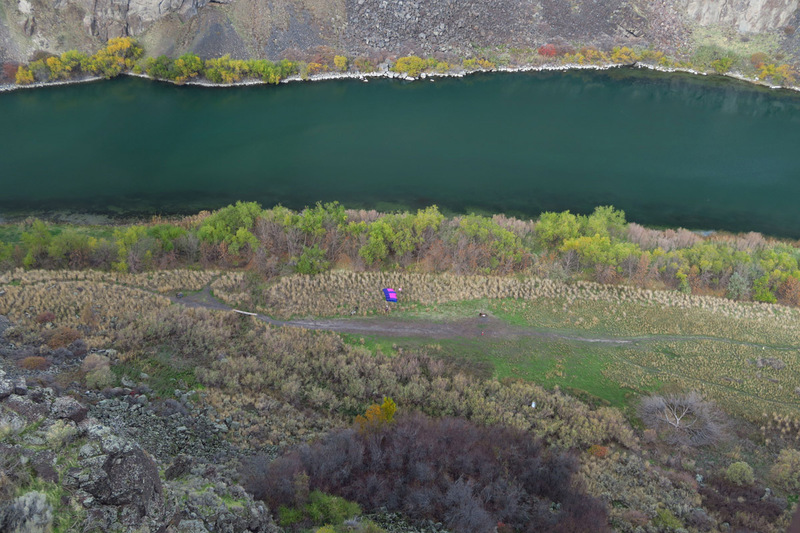 Note blue and pink chute slightly to the left of center. It’s an incredibly short ride. Three out of four land near their target, while one drifts over toward the river and lands in the trees. In effort to prolong laundry chores as long as possible, we opt to keep exploring. 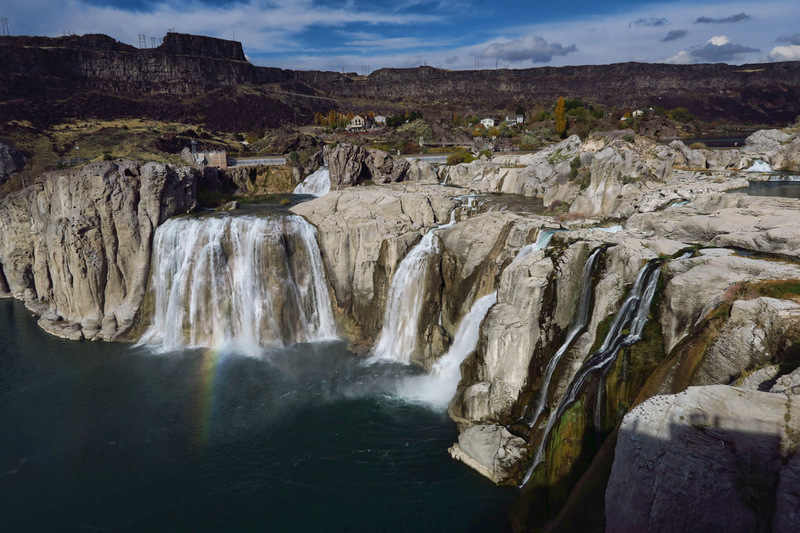 On the advice of the helpful volunteer at the Snake River Canyon Visitor Center, we continue on up the Snake River to Shoshone Falls, known as “Niagara of the West.” At 212 ft, the falls are actually 45 ft higher than Niagara Falls. Even though the flow rate is diminished in the fall months, it’s still an impressive sight. 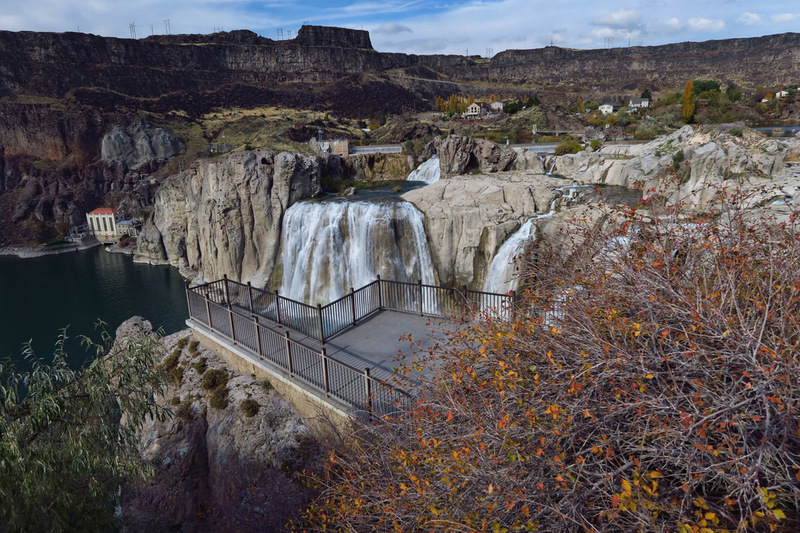 Shoshone Falls, impressive even in its low flow state. 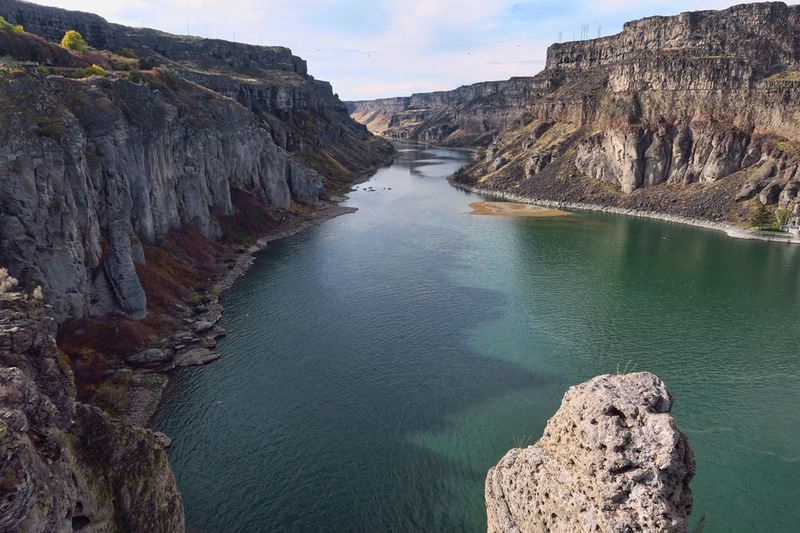 Looking down river from Shoshone Falls Overlook. 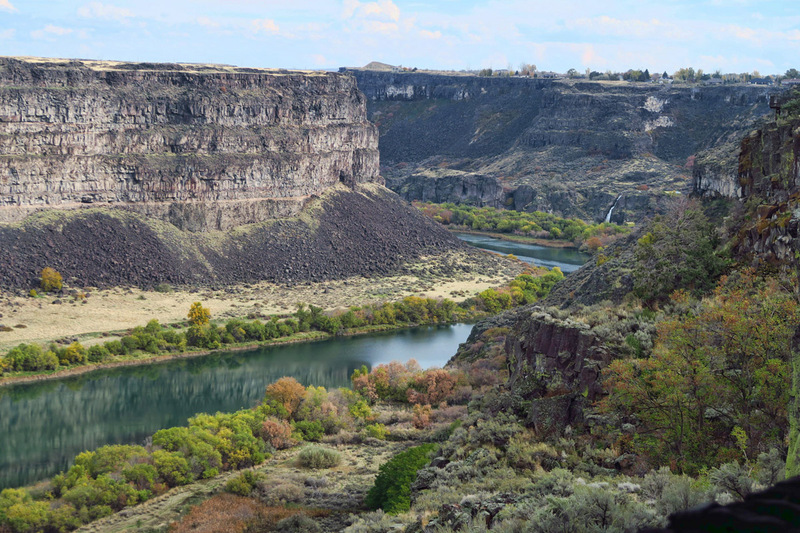 As for Twin Falls, the town’s namesake? Not so much. One of the twins has died, while the second is on life support. As for driving the additional two miles to view it, I would have to say, particularly at this “low flow” time of year, skip it. It’s all about Shoshone. Twin Falls is down to a solo trickle at this time of year. 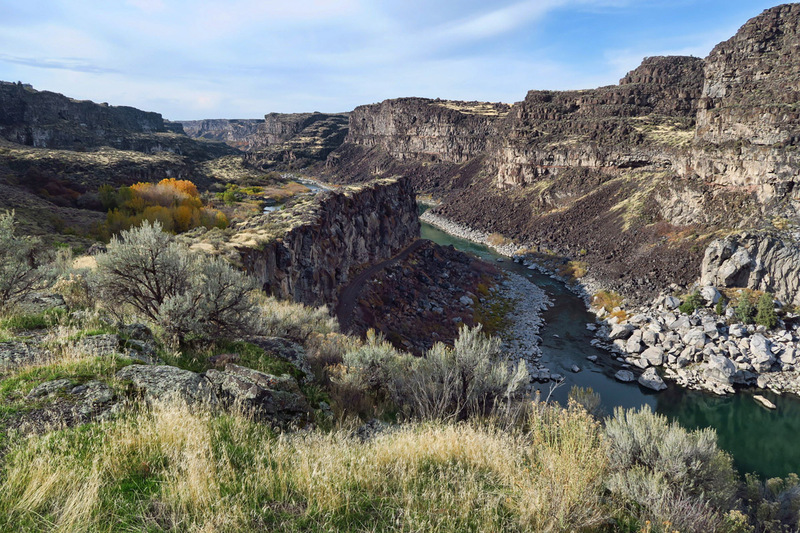 Looking downriver from Twin Falls. Another place in Twin Falls that I recommend is the quiet, quaint little Rock Creek Park. 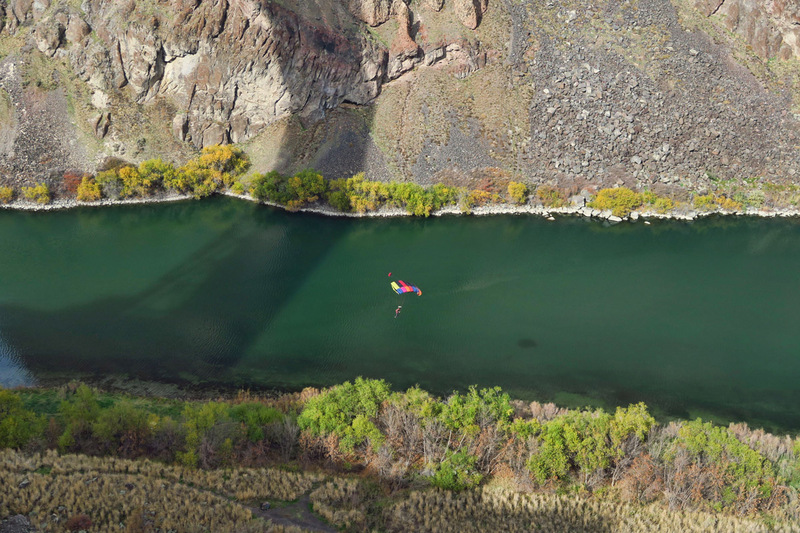 Almost impossible to find, but once you land there nestled along a creek in a quiet little gulch, it’s convenient to everything in town, but far removed from the mayhem. At $15 a night and right off Hwy 93 in route to Nevada, it’s a real “in town” find. Check Campendium for further tips on how to locate. 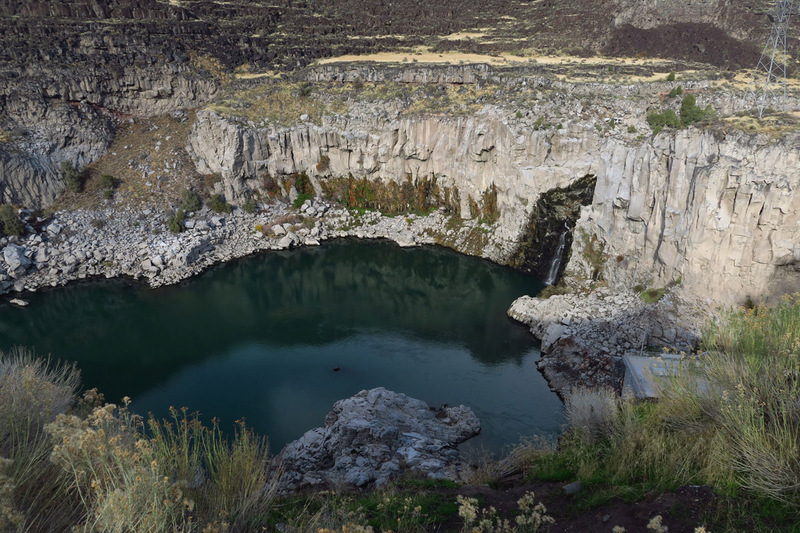 This entry was posted in Idaho and tagged Perrine Bridge, Rock Creek Park, Shoshone Falls, Twin Falls by Suzanne. Bookmark the permalink. Darwin must have influenced the decision for no railings there, too. You won’t be seeing me close to the edge. I have bookmarked all your posts for the last 2.5 months. Now, to find the time to make the same trip as you and Don. Good luck on your next adventure and the same to Don with his dental work. Has he had work done in Mexico before? Hi, Marilyn, thanks for the nice comment. 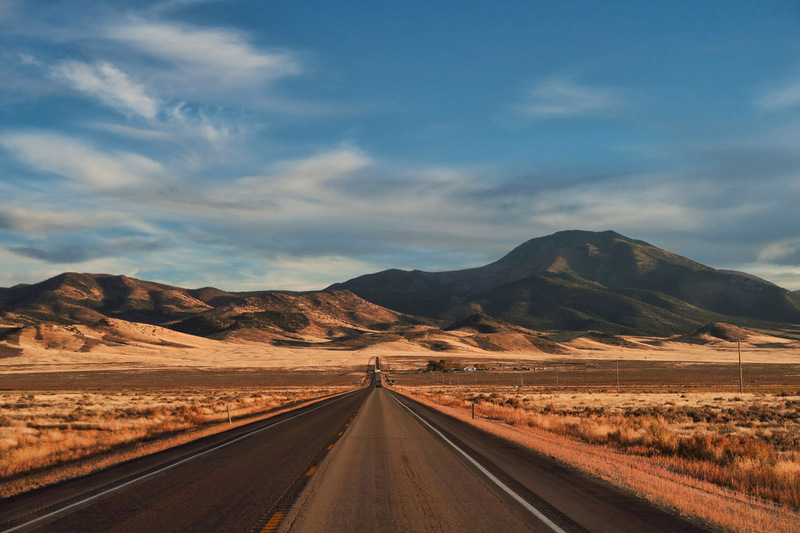 Let me know if you have any questions when you get ready to take the trip. Don has been getting his dental work done in Mexico for about 5 years now, I think. He has a dentist in Guanajuato that he likes and trusts. What a great few months being able to travel with your brother! Neither of you will ever forget this adventure, are there plans for a repeat next year? Hi, Jim and Barb — I think Don’s plans include more travel south of the border next year, so this was likely a “one of a kind” journey. Thanks for following along! As always you are wealth of well presented information! Not that we’ll be base jumping, but we will be in the area for the eclipse. Thanks, Alex, but no matter how hard I try to get it in line, the blog always lags behind. I’ll make sure to add this to the “next time” list. Wow! Those falls . Never heard of them . Beautiful area. That scenery is gorgeous, with feet on the ground. All that jumping and you’re worried about rails on cliff edges? Gaelyn, I am not worried about rails, but more about lawyers. LOL! It must have been a sad day to say goodbye to Don. But so good to have spent such quality time with him, wasn’t it?